LAS VEGAS (AP) — A few seconds after Conor McGregor tapped Khabib Nurmagomedov’s arm and submitted to the champion’s choke, Nurmagomedov climbed the cage and leaped at the men in McGregor’s corner, setting off a prolonged brawl inside and outside the octagon. A seminal moment in mixed martial arts was immediately overshadowed by a tawdry ending Saturday night when the UFC’s infuriated lightweight champion took his conflict with McGregor beyond their bout. McGregor tapped out in the fourth round of his comeback fight at UFC 229 against Nurmagomedov, who then scaled the cage and scuffled with another fighter manning McGregor’s corner. Meanwhile, two men apparently from Nurmagomedov’s entourage climbed into the cage and attacked McGregor, who defended himself before security personnel separated everyone. Order was restored with no apparently serious injuries, but the scuffles immediately dwarfed one of the biggest and most lucrative shows in UFC history. Nurmagomedov’s purse has been withheld by the Nevada Athletic Commission pending an investigation, White said. He also claimed three members of Nurmagomedov’s camp were detained and released by police because McGregor refused to press charges against them. White acknowledged the UFC might strip its title from Nurmagomedov (27-0), a Dagestan-born Russian fighter who trains in San Jose, California. Nurmagomedov appeared briefly at a post-fight news conference after midnight. He apologized to the Nevada State Athletic Commission, saying the brawl was “not my best side,” but also condemned McGregor’s barbed pre-fight taunts. The wild scene occurred after McGregor (21-4) got caught in a choke by Nurmagomedov, who punctuated this simmering rivalry with an impressive victory over the superstar who infamously attacked a bus carrying Nurmagomedov in Brooklyn last April. McGregor shattered the bus windows with a hand truck because he was angry about Nurmagomedov confronting one of his teammates earlier in the week. 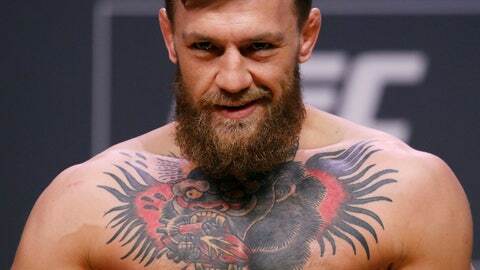 The post-fight trouble started when the Russian champion from Dagestan stepped away from the prone McGregor and immediately pointed at the Irishman’s corner, shouting and throwing his mouthpiece. The men in McGregor’s corner appeared to respond with taunts, and Nurmagomedov climbed over the fence and fought with Dillon Danis, a Bellator welterweight who trains with McGregor. One of the two men who attacked McGregor in the cage was widely identified as Zubaira Tukhugov. The Chechen featherweight is scheduled to fight in three weeks against Artem Lobov, the McGregor team member who was confronted by Nurmagomedov in April. White said if Tukhugov was the man in the ring, he will never fight again for the UFC. Nurmagomedov and McGregor both left the ring before the championship belt could be put around Nurmagomedov’s waist, and fans in the pro-Conor crowd threw beers and debris at Nurmagomedov on his way out. White said he feared a melee in an arena if he awarded the belt to Nurmagomedov. UFC heavyweight champion Daniel Cormier is Nurmagomedov’s teammate at their gym in San Jose, and he calmed Nurmagomedov after the bout. McGregor was arrested after seriously hurting two other fighters with broken glass from the bus attack in Brooklyn, but Nurmagomedov shrugged it off and won the lightweight title by beating Al Iaquinta. When McGregor agreed to return to the UFC, he eagerly accepted Nurmagomedov as his opponent. Before the post-fight madness, Nurmagomedov firmly asserted his grappling dominance over McGregor’s striking skill in the Irish superstar’s first MMA bout in 23 months. McGregor hadn’t been in a fight since losing his boxing match with Floyd Mayweather last year, and Nurmagomedov proved an insurmountably tough opponent for his comeback. McGregor’s dislike for Nurmagomedov likely fueled his decision to take a fight that created a difficult stylistic matchup for him. McGregor’s strength is his striking, while Nurmagomedov is one of the most dominant grapplers in UFC history. Four security guards separated the fighters while they didn’t touch gloves before the bout, and Nurmagomedov went for a takedown in the opening minute while dominating the opening round. Nurmagomedov decided to stand and strike with McGregor in the third round, apparently unafraid of McGregor’s famed power. McGregor landed several significant shots, but Nurmagomedov took them and eventually reasserted control against the cage. McGregor did decent work in the fourth round before Nurmagomedov got control, climbed on McGregor’s back and finally submitted the former two-division champion. All three judges’ scorecards favored Nurmagomedov 29-27, with the champion winning the second round 10-8 on all three cards. McGregor won the third round on every card. Before the main event, former interim 155-pound champion Tony Ferguson staked his claim to be the next contender for the lightweight belt with a thrilling stoppage victory over Anthony Pettis. Even Ferguson realized that anything he had done wouldn’t get much attention.